Chords are built using notes from scales. You build a major chord with the first, third and fifth notes of major scales. To make a minor chord, you simply flat the third note of the major scale. Power chords, sometimes called fifth chords, are two-note chords that omit the third note, leaving an open tonality. This leaves more room for improvisation because the absence of the third not of the scale isn't there to dictate major or minor. While power chords are often associated with rock and metal guitar music, you can play power chords on piano with equal success. Form a major chord on your piano keyboard. Try a C major chord first. Place your first finger on any C on your keyboard, your second finger on the third note of the scale (an E) and your third finger on the fifth note of the scale (G). This is a full C major chord. The notes are derived from the C major scale: C-D-E-F-G-A-B. As you can see, the first note is C, the third is E and the fifth is G.
Lift your second finger away from the E note. Keep your first and third fingers on the keyboard. Play those two notes together. This is a C power chord, also known as a C5 chord. Play the full C major and follow it immediately with the C power chord to hear how removing the third note changes the tone. 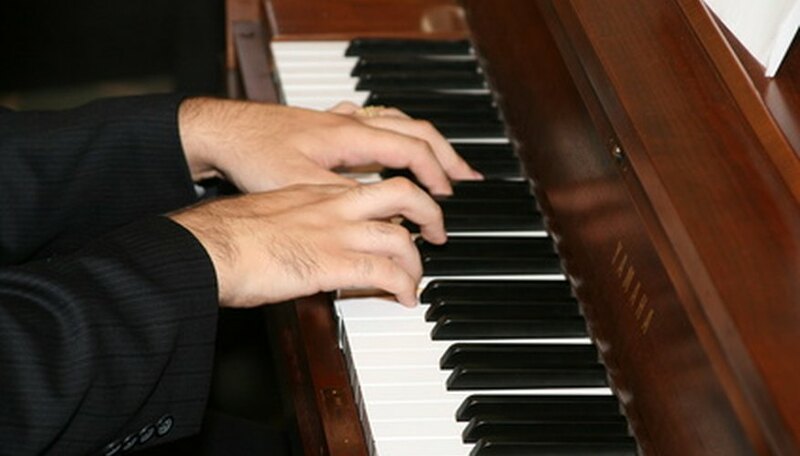 Play the C major and move your second finger to the black key just before the white key. This is a C minor. Playing the three chords one after the other will help you hear how the C power chord opens up your ability to add more improvisational notes to your playing. Play your power chords with volume. This is another feature of the power chord, especially in rock--power chords typically are played hard. Play a power chord progression based on the C, E and G power chords. Play those chords in that order over and over, hitting the keys hard. This is a power chord progression. While there are numerous examples in the music world, listen to the Who song "Baba O'Riley" to hear power chords repeated throughout the verses of the song. Thicken the sound of your power chords by doubling the first or third note in the bass cleff (the left hand) of your piano.